The Oregon Ducks have the top-rated recruiting class in the Pac-12 Conference and the best in school history. 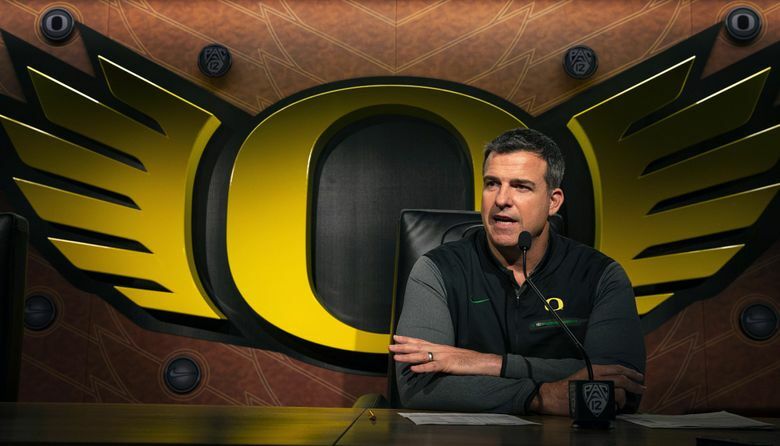 The traditional signing day Wednesday merely padded Oregon’s already stellar recruiting class, the best in school history. The major ranking services all had Oregon’s class in the top 10 nationally, which also put the Ducks atop the Pac-12 Conference. Oregon got commitments from 21 prospects when the early signing period opened in December. Among them was five-star defensive end Kayvon Thibodeaux, who was ESPN’s top overall prospect and the highest-ranked signee ever for the school. The Ducks added three more recruits Wednesday, including defensive tackle Kristian Williams, a four-star prospect out of Memphis, Tenn., who announced on Twitter last weekend that he had decommitted from Minnesota. Oregon also added Jamal Hill, a safety from Morrow High School in Georgia, and cornerback DJ James from Spanish Fort High School in Mobile, Ala. The Ducks went 9-4 last season in Mario Cristobal’s first year. The team got a boost heading into the upcoming season when quarterback Justin Herbert decided to stay in Eugene for his senior year. One of the prospects that Oregon signed in December was Herbert’s little brother, tight end Patrick Herbert. • Colorado: One highly skilled Shenault at wide receiver is tough enough. Two is quite a handful. La’Vontae Shenault announced his intention to follow his big brother to Colorado. Like his big brother, La’Vontae Shenault is 6-foot-2 and played at DeSoto High School in Texas. La’Vontae amassed 135 catches for 1,717 yards and 12 TDs over the past two seasons for DeSoto. • USC: The Trojans added elite receiver Kyle Ford to its recruiting class. Ford, an Orange County product, had his senior season of high school cut short by a knee injury. He favored the Trojans early in the recruiting process, but Oregon, Washington, Colorado and Michigan pursued himl. The abrupt departure of new offensive coordinator Kliff Kingsbury after 34 days shook up the Trojans’ recruiting class and led to the departure of receiver commit Bru McCoy, who spurned USC for Texas. But Kingsbury’s departure and Graham Harrell’s arrival didn’t sway Ford, who is likely to be the top-rated recruit in USC’s class. • UCLA: Charles Njoku decided not to follow his two older brothers to the University of Miami. Instead, he is headed west. The 6-foot-4, 210-pound wide receiver from Wayne, N.J., signed with UCLA. Charles Njoku is a four-star prospect, according to Rivals.com. He caught 52 passes for 1,106 yards and 16 touchdowns last year. • Utah: The day had an international flavor with the Utes bringing in 6-foot-7 offensive lineman Bamidele Olaseni, a native of London who played last year for Garden City Community College in Kansas, and fellow 6-foot-7 offensive lineman Luke Felix-Fualalo, a former rugby player in Australia who played last year for prep powerhouse Mater Dei in California.